Get FISA Right started on June 26, 2008, with posts by Mardi S on my.barackobama.com and Mike Stark on Open Left. We were the first high-profile grassroots social network activism campaign in the US and got enough attention that Obama responded to our open letter. Still, we and our allies lost that battle over the disastrous FISA Amendments Act. And since then, it’s been more of the same. Five more years of the NSA vacuuming up our phone and internet information. Five more years without meaningful oversight. Five more years of evasion and outright lies in Congressional testimony. Five more years of secret court rulings. Five more years of legal maneuvering to try to prevent EFF, ACLU, or anybody else from challenging the laws’ constitutionality. Five more years of Patriot Act and FISA reauthorization. But after the firestorm of publicity in response to the recent leaks, I’m increasingly optimistic that momentum is building for a change. The NSA’s lies and evasion are getting spotlighted in major media outlets. Bills advocating transparency in the House and Senate are getting bipartisan sponsorship. The huge cost to US tech companies’ international business is pushing more and more of them to take a stand. EFF, ACLU, and other civil liberties organizations continue to fight the good fight — and the leaks (as well as the details government spokespeople have revealed in resposne to the leaks) may well have improved the legal situation by documenting standing and reducing the scope of the “state secrets” defense. As more and more details come to light, people across the political spectrum are asking whether this is really the kind of world we want to live in. And just as groups like Get FISA Right sprang to life in 2008, the next generation of online organizing is emerging in 2013. StopWatching.us builds on the past successes of civil liberties activism like the alliance between civil liberties organizations and tech companies that beat back SOPA and CISPA. 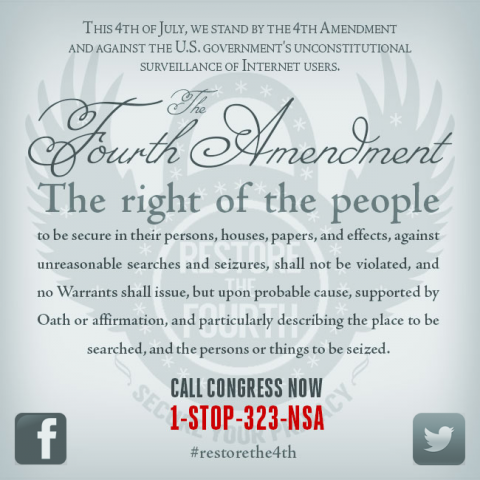 And Restore the Fourth‘s rallies on the 4th of July are a great example of the vision Get FISA Right member (and Bill of Rights Defense Committee Executive Director) Shahid Buttar laid out in Restoring the 4th Amendment: in-person organizing at the local level. I’ve been going to Restore the Fourth’s daily meetings and the energy is incredibly exciting. Not only that, they’re getting a lot of support from other groups … including Get FISA Right! There are other ways we can continue to contribute too; see here and here for some thoughts, and share your perspectives. So, happy birthday to Get FISA Right. We’ve accomplished a lot over the last five years, and I’m looking forward to what comes next! This entry was posted on Wednesday, June 26th, 2013 at 9:12 pm and is filed under Uncategorized. You can follow any responses to this entry through the RSS 2.0 feed. You can leave a response, or trackback from your own site. 2 Responses to Happy Birthday Get FISA Right: Looking forward to what comes next!